NDP Convention: Wab Kinew celebrates after winning the NDP Provincial leadership at the RBC Convention Centre. 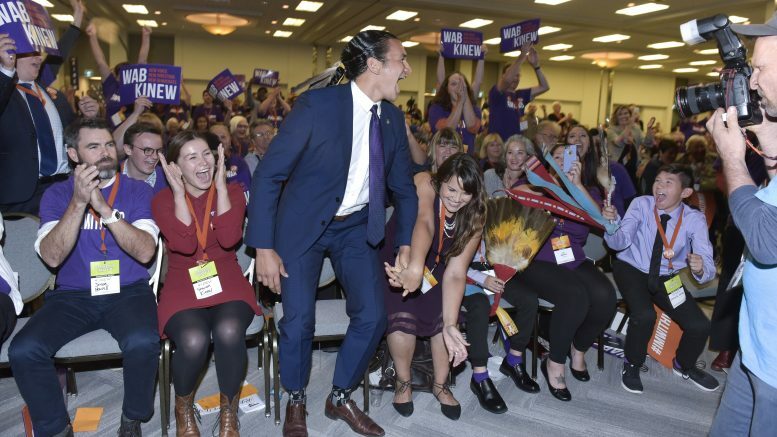 Manitoba’s New Democratic Party (NDP) selected Wab Kinew as its new leader at the party’s leadership convention in Winnipeg Saturday. The leadership race between veteran politician Steve Ashton, the former MLA for Thompson who also held various cabinet portfolios, and Kinew, a first time MLA for Fort Rouge, saw overwhelming support thrown behind the rookie politician. A total of 987 ballots were cast by convention delegates. Kinew beat out Ashton by a nearly three-to-one margin, collecting 728 votes to Ashton’s 253. Ashton lost his seat representing Thompson, which he held since 1981, more than a year ago when the Progressive Conservatives formed a majority government in 2016. Ashton previously unsuccessfully ran for leadership twice in 2009 and 2015 respectively. Both candidates spoke to convention delegates before ballots were cast. He said that the policies being proposed and implemented by the premier do not reflect the values Manitobans hold dear, including shared prosperity and affordability of public services, such as hydro and health care. Earlier this week, Pallister suggested that Manitobans may have to pay health care premiums to control Manitoba’s rising health care costs. Kinew said “Heath care is an act of love” and that he will repeal the cuts to health care and eliminate the health-care premiums, if implemented. He also vowed to grow the economy of Manitoba through the creation of a comprehensive job plan. While Kinew shared his vision for the future of the party, Ashton focused his speech on highlighting the past victories of the NDP. Ashton vowed to fight the cuts to health care, along with raising the provincial minimum wage to $15 an hour. Speaking to reporters after the event, Kinew promised to help students organize against tuition hikes. 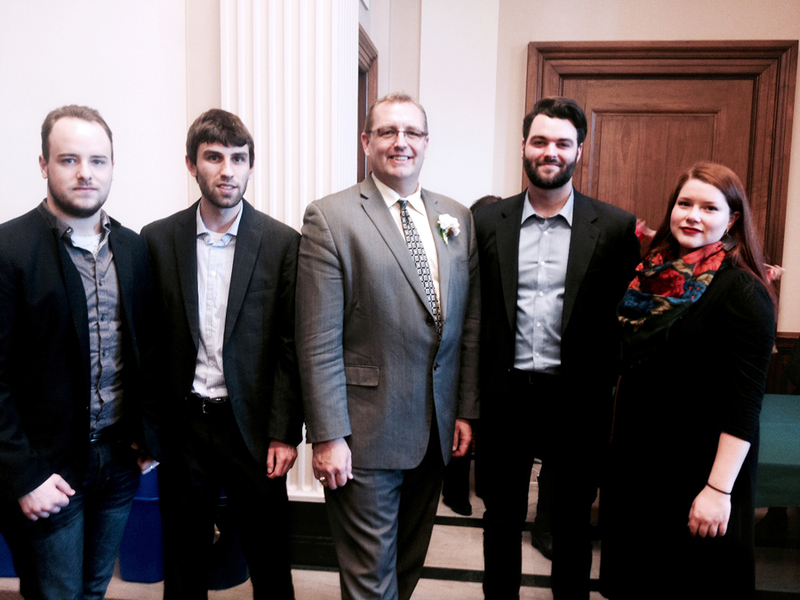 University students in Manitoba will likely experience annual five per cent tuition increases if Bill-31 is passed. Kinew also noted that there are other barriers affecting access to post secondary education. Mohinder Saran, an independent MLA for the Maples, ordered copies of Kinew’s court records, revealing domestic violence charges against Kinew in August. These charges were laid by an ex-partner in 2003. The chargers were stayed in 2004. Saran claimed that he was working for the Ashton campaign during the time of the revelation. Ashton denied Saran’s involvement in the campaign altogether. During the convention, Kinew reassured the delegates that he is not the man he was when the charges were laid. “I will continue to be an ally for women in our province as they stand up to for their right to live free of violence, harassment, and discrimination,” he added later in his victory speech. The newly-minted leader gave a victory speech after the results were declared and said that he is “humbled” by the support he has received. “I want to say that I will take this role tremendously seriously and conduct myself with the greatest honour, integrity, and honesty,” Kinew added. “But I think that what you saw in the room today, many long-time New Democrats showing up and also many new members as well, new delegates, people participating in their first convention,” he said. “For us, I think that that’s a great sign that things are starting to pick up for the party,” he added. Kinew said that as leader he will focus his efforts on fundraising, signing up new memberships and candidate recruitment in the coming months. Commenting on the message his appointment, as an Indigenous person, sends to Manitobans, Kinew said it is an example that society is changing and recognizing diversity. “One thing that is very important to me is that as a society we are getting closer to day where everyone can reach their full potential, can contribute to their fullest,” he said.